Fancy A Little Adventure With Your Croissant? The French-speaking province of Québec is nearly three times the size of France, so it is well worth spending longer here, to really explore the landscape, culture and people of this unique part of Canada. And as usual we make sure that there are plenty of optional activities for you to get out there and explore in a way that suits you best. Montréal is buzzing, cosmopolitan; the commercial heart of French Canada and a magnet for French-speaking people from around the world. Québec City is more quaint, historic – and the place to learn about the fascinating history of France in North America. We get you away from the main centres – out into the countryside and the quaint villages of Québec. Here you can enjoy exploring the region’s beautiful countryside and the shoreline of the St. Lawrence in a more intimate setting – and you’ll be amazed by the local cuisine, wine, and adventures awaiting you as you travel the backroads at a leisurely pace. With our almost daily tour and adventure options there is something for most tastes and abilities (and we can always give you more choices when you call) – and our carefully selected accommodations are the perfect places to share stories over a glass of wine and a great meal. Montréal has the old world charm of Europe with a contemporary design. There is a real joie de vivre here and since most Montréalers are bilingual, there’s no need to worry about speaking any French. During the summer months, the smell of fresh made pastries and live music waft from open air cafés, and outdoor patios. A days wander can take you past stunning heritage landmarks such as the Notre-Dame Basilica and Place Jacques-Cartier and along the quays of the Old Port, where a host of river excursions and activities take place. Known for their festivals, the Montreal Jazz Festival, Just for Laughs comedy festival and yearly Formula 1 Grand Prix make Montréal an exciting destination in the summer months. Overnight at Hotel Nelligan. In a 19th-century building in the heart of Old Montreal, this upscale hotel is only 5 minutes walk from the Basilique Notre-Dame, the Promenade du Vieux-Port and multiple restaurants, shops and galleries. The warm rooms feature thoughtful amenities along with free Wi-Fi. The hotel has a refined restaurant, an atrium lounge and a rooftop bar if you choose to enjoy! Today you’ll begin your exploration of the French-Canadian countryside. You’ll find yourselves travelling over rolling hills, through quaint villages and past picturesque pastoral vistas today as you enter the Cantons de l’Est or the Eastern Townships. Nestled between northern Maine, New Hampshire, and Vermont, the Townships share a similar climate and architectural & cultural heritage with much of New England.Three heritage trails that include 66 historical and culturally-important buildings, one historical mining route, and a general store transformed into a cultural and community centre make the area of the Eastern Townships a site worth seeing! The, is a marked tourist route highlighting the natural and man-made heritage of the area. Overnight at Au Saut Du Lit. The charming cottage is located in Magog in Quebec's Eastern Townships. Enjoy a delicious continental breakfast, included in your stay, and close proximity to museums, entertainment, dining and Lake Memphrémagog. Today the day is yours to explore the treasures of the Eastern Townships. Whether you choose to explore the region’s two wine routes, taste its delicious wares, or march up a mountain - you will not be left wanting. Memphremagog is one of the largest tourist regions in the Eastern Townships, boasting an exceptional location, the stunning Lake Memphremagog and the Appalachian Mountains as its backdrop. The area is a lively place year-round, with a multitude of cultural, sporting, gourmet activities and events. Come during July and see the beautiful colours of the lavender fields or visit in September for the fall colours festival. All aboard the Orford Express! Immerse yourself in the Quebec countryside on this train and dining excursion featuring locally-sourced seasonal delicacies paired with some of the most beautiful scenery this province has to offer. Enjoy a gastronomic cruise on Lake Memphremagog featuring gourmet food from local Eastern Township ingredients. Live music entertains you as you cruise along the lake and take in the beautiful surroundings from your window on the luxury boat. Today you have a full day to explore this rich countryside further. After departing the Eastern Townships you’ll find yourself in two distinct areas of Québec: Central Québec (Centre-du-Québec) & the Lower Saint Lawrence (Bas-Saint-Laurent). You have plenty of time to explore each, so be sure to make stops along the way to indulge in all this beautiful province has to offer. Overnight at Auberge de la Pointe. Overlooking the St. Lawrence River, this classic hotel offers beautiful views and close proximity to activities such as whale watching. Enjoy on-site amenities including an indoor pool, hot tub and spa. The large outdoor terrace has lots of cozy places to sit and watch the sunset. 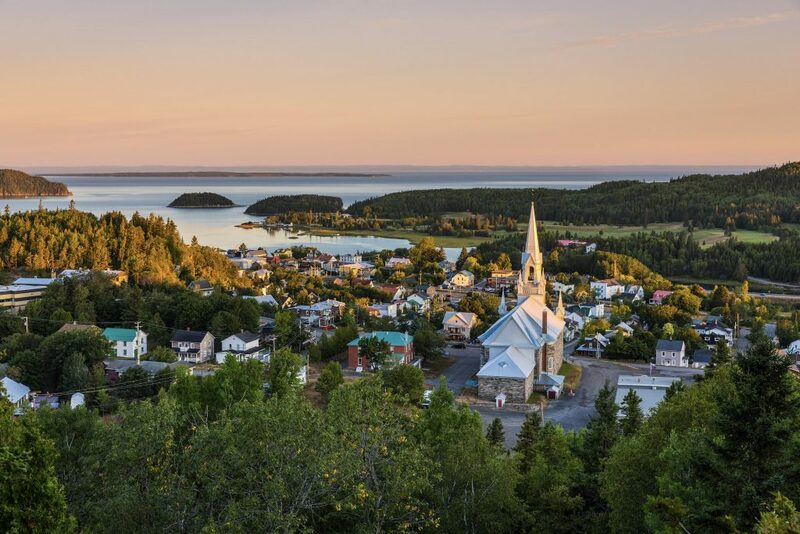 As you travel today along the southern Saint Lawrence River, enjoy the spectacular vistas, charming villages and many activity options the area has to offer. Located on the south shore of the St. Lawrence, lies the picturesque region of Bas-Saint-Laurent. Rich in beautiful nature, wildlife and history, the region offers a little something for everyone. Visit the quaint coastal villages, historic lighthouses, museums and artisan shops, as you drive along the shore to gain a deeper knowledge of the history and heritage of the area and the people who call this stunning region home. The amazing historical site provides an interactive and in depth look into over 200 years of maritime history. Onsite you have access to the HMCS Onondaga, the first submarine open to the public for viewing, a pavilion displaying artifacts and tells the story of the wreckage of the ocean liner Empress of Ireland, and the Pointe-au-Pere Lighthouse buildings. Overnight at Auberge Du Mange Grenouille. This charming Auberge faces the Bic Islands, just minutes from Bic National Park. Enjoy the whimsical decor and amenities including a restaurant and wine bar. Following the shores of the St. Lawrence River you’ll make your way to the local commuter ferry and traverse across the St. Lawrence River to Les Escoumis. Keep your eyes peeled for whales and other wildlife on your journey. Once in Les Escoumis, make your way to the seaside town of Tadoussac located at the mouth of the Saqueney River. Board the Heritage I and cross the Saint Lawrence River northbound from Trois-Pistoles to Les Escoumins. Keep your eyes open for marine wildlife and enjoy the views as you make the crossing. Overnight at the Hôtel Tadoussac. The landmark property is near restaurants, pubs, and small shops, and offers a spectacular view of the St. Lawrence River. Its whitewashed walls, red roof and maritime colours reflect the beauty of an earlier era. The charming hotel offers great family-friendly amenities including an outdoor pool, tennis court, miniature golf and a spa.